Touch Of Belle : #BDIB EST Twitter Chat! I have some very exciting news for all American and Canadian bloggers! There is now a EST chat which means you no longer have to sneak out of work to take part in the GMT chat, you now have your very own! You can join in no matter what your blog niche! 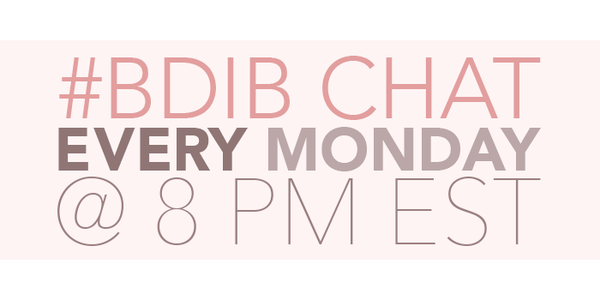 The chat is hosted by Dora (@adropofindigo) and will be every Monday 8pm EST, for more details follow the @blogsdoitbetter and Dora's account for more information! We would love if you could spread the word and get as many people to join in the chat! Hope to see you there tomorrow! Its great news for everyone in EST! We are trying to spread the news to make it more well known! They are a brilliant way to get to know other bloggers! I am so glad I started the #bdib chats, they have grown so much! So much fun!!! Thanks for having me Gemma!!!! Good time and GREAT NETWORKING OPPS. !!!! Thank you so much for Joining in Erin!! I am really glad you enjoy the #bdib chat, It makes me really glad that I started the #bdib chat!